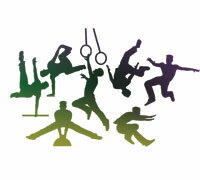 You don't have to be a gymnast to have a party at CCG! We cater to sports teams, private groups, team building, fundraisers and corporate events from ages 3 to 103! 50 Minutes of gymnastics obstacle courses, trampolines, foam pit and rope swings followed by 40 mintues in our private party room. You may decorate the party room and provide the food and beverage. You can even order pizza! 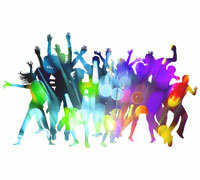 This party option is great for a tween or teen! You provide the playlist and we provide the light show and glow sticks. 50 minutes in the gym to "boogie down" and 40 minutes in our private party room. Boys and girls of all ages who love the popular show, "American Ninja Warrior" will love this party option! Obstacle courses and challenges just like the show: traveling rings, rock wall, warp wall and much more plus 40 minutes in our private party room. Bring your sports team or private group. 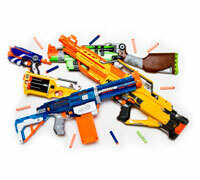 We supply the Nerf guns, ammo and safety goggles, as well as 50 minutes on our Nerf "battlefield" complete with shooting forts, barriers and blockades. Recommended for ages 6-12. After the battle, kids can enjoy 40 minutes in the party room. This top-notch party option includes a sleepover in the gym! 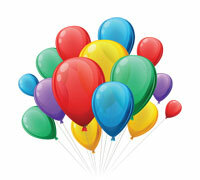 Kids will enjoy any of our themed parties, followed by a pizza party complete with root beer floats! Bring your favorite movie to watch on the projection screen. 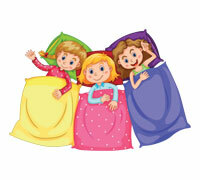 Then, kids can find a fun place to sleep in the gym! Available Saturday nights beginning at 6:00 PM until 8:00 AM the next morning. Bring a sports team or private group! Additional child: $10 Each child. Additional gym time: $30/half hour. *We are more than happy to accommodate any requests you may have. "The Ultimate" parties are booked Saturday evenings from 6 PM to 8 AM Sunday morning. Summer Parties: Dates and Times By Request: Please Call!